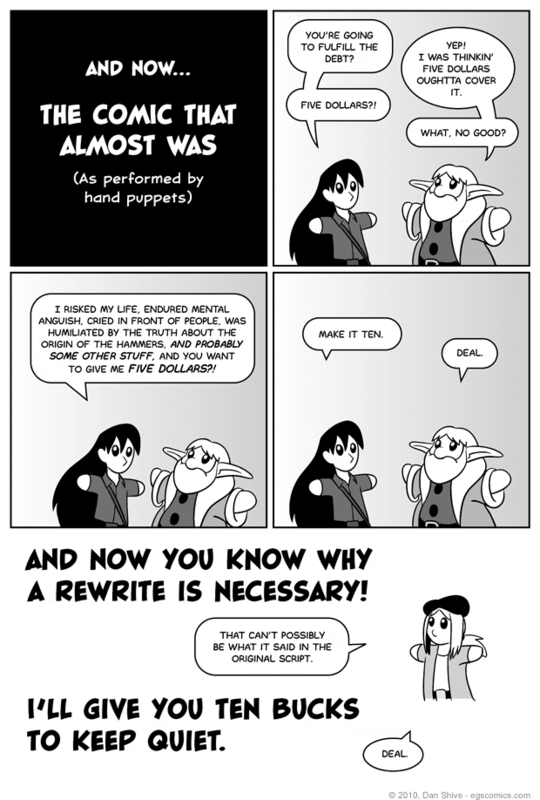 I hate, hate, HATE delaying the story comics on account of a rewrite. Truth is, though, it's necessary. Nothing major from a "this and that happens" standpoint is being changed, but how it's carried out needs to be revised to keep it from being something JRR Tolkien would accuse of having too much exposition. I don't want to follow up the moment we just had with a script that makes me cringe. Not gonna do it. I just wish I'd realized this and fixed it sooner. Anyway, I wanted to have something worth seeing up today even if I couldn't have a story comic, but I didn't want to take away too much time from being able to work on said script, so... PUPPETS! The joke is probably older than the invention of puppets, but I think it's cute, so everyone else probably will too, right? ...Right?